98% of AutoGas is produced in America. Supporting our domestic economy and helping create American jobs is easy with propane AutoGas. Instead of sending your money overseas for foreign oil, think about the fuel that’s made right here in the U.S.A. 98% of our nation’s propane AutoGas is produced in the U.S., so using AutoGas means reducing our dependence on foreign oil. Propane AutoGas is a by-product of natural gas and oil refining. 98% of our AutoGas comes from U.S. production. Our nation has a wealth of natural gas resources, and approximately 68% of AutoGas is derived from natural gas processing. Don’t wait to start your AutoGas program. AutoGas is a viable and readily available fuel, right now. With the support of Alliance AutoGas and more than 2,500 AutoGas fueling stations already in place throughout the U.S., Sharp Energy onsite fueling technology makes AutoGas a viable fuel for your fleet right now. The United States currently has more than 2,000 public AutoGas fueling stations and is growing. If that number doesn’t sound big enough to you, don’t worry – we agree. 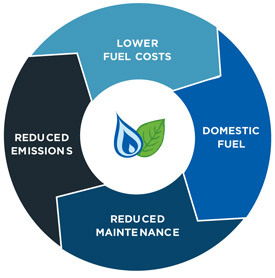 That’s why Sharp Energy will install onsite fueling at your fleet base at virtually no cost to your organization. After we build the infrastructure, we’ll make sure you’ve got a year-round fuel supply to keep your AutoGas fleet up and running.